Home favourite Lewis Hamilton was beaten to top spot by his Brackley-based Mercedes team-mate Valtteri Bottas in both practice sessions for the British Grand Prix on Friday. 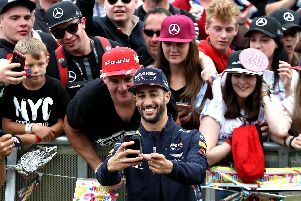 Hamilton, the 32-year-old Briton who is bidding for a record-equalling fifth victory on home soil in Northamptonshire, has seen his preparations this week overshadowed by his no-show at a Formula One promotional event in London on Wednesday night. And it was Finn Bottas, the 27-year-old fresh from his second victory of the campaign in Austria last Sunday, who led the way at an overcast Silverstone. Hamilton, however, failed to post his best time in the afternoon session on the supersoft tyre - the quickest of the Pirelli compounds available this weekend - after he ran off the track through the super-quick Becketts section. He was still just 0.047 seconds slower than Bottas. It will provide the triple world champion with enough confidence that he can get the better of his in-form team-mate in what could prove to be a pivotal qualifying session on Saturday. Hamilton won from pole here in 2015, and again last year, and how the Englishman could do with another dominant victory as he bids to trim the 20-point margin to rival Sebastian Vettel at the summit of the championship. Vettel, who has been so consistent this season, was only fourth here, four tenths of a second slower than the Mercedes pair. His Ferrari team-mate Kimi Raikkonen, who spun off the circuit during the second session, was also faster after he ended the day third in the order. Earlier, Vettel became the first driver to trial the so-called ‘shield’ - the FIA’s third different concept aimed at improving cockpit protection. The device, made of transparent polycarbonate, is designed to sit in front of the driver and deflect any flying debris. Vettel completed only three laps with the safety concept, which is now the governing body’s preferred option over the ‘canopy’ and the ‘halo’. The latter was described by Hamilton as the ‘worst-looking modification’ in the sport’s history. “I tried it this morning, and I got a bit dizzy,” Vettel said. The shield is expected to be used again after the summer break with the FIA aiming to carry out a full track test at September’s Italian Grand Prix. Aside from Hamilton’s bizarrely-timed two-day holiday with friends to the Greek island of Mykonos - leading to him missing Formula One’s live parade through London - the other talking point this week has been the decision taken by the British Racing Drivers’ Club to trigger a release clause in its F1 contract after 2019. Such a move means this year’s event could be one of the final grands prix to be staged at the Northants circuit unless a new deal with Formula One’s owners Liberty Media is agreed. As expected, the British fans were out in force on Friday, with 350,000 spectators expected over the course of the weekend and a near sell-out crowd for Sunday’s race. Red Bull have brought a number of updates with them to Silverstone. Max Verstappen was fifth, 0.6 sec slower than Bottas, with Australian Daniel Ricciardo sixth in the order. Fernando Alonso, who is set to serve a grid drop here following a series of penalties for changes to his Honda engine, was ninth. Britain’s Jolyon Palmer, who also took an unscheduled trip across the gravel, finished 18th in both practice sessions.